Note: The webinar features version 2 of the rubric, but the processes for getting started also apply to version 3 of the rubric. Dr. Anneke Markholt, as a CEL associate director, designs and directs the Center's district partnerships focused on the development of instructional leadership. 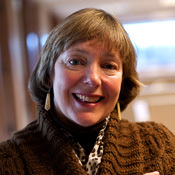 She is an affiliate faculty member at the University of Washington in the Department of Educational Leadership and Policy Studies and is the co-author of Leading for Instructional Improvement: How Successful Leaders Develop Teaching and Learning Expertise. 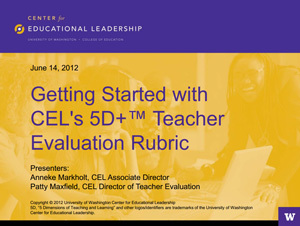 Patty Maxfield, as CEL's director of teacher evaluation, supports district partnerships by providing instructional and leadership coaching connected to CEL’s 5 Dimensions of Teaching and Learning instructional framework and the 5D+ Teacher Evaluation Rubric. Patty has been involved with public education for more than 30 years as a teacher, teacher leader, facilitator and administrator.